Take the Maokong Gondola to Maokong Station and turn left as you exit the station. Follow Lane 38 of Section 3, Zhinan Road toward the direction of Tianen Temple. You will arrive at the Tea Promotion Center in about 15 minutes. Take buses S10 or BR15 toward Maokong Gondola Station (Tea Promotion Center and the Sky Trail). 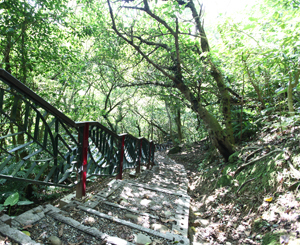 To enrich the tourist experience in Maokong, the Geotechnical Engineering Office of the Public Works Department, Taipei City Government, connected the various tracks to form a tea-themed circular trail. 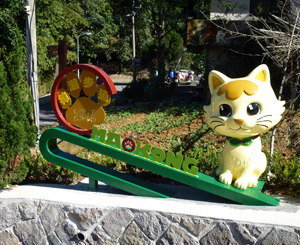 Visitors may take the Maokong Gondola to Maokong Station, turn left at the exit and follow the street toward the Tea Promotion Center to come to the Health Trail opposite it. Along the way, you will pass scenic spots such as the century-old camphor trees, cypress sea, tea terraces and potholed riverbed, as well as the Sky Trail, suspended bridge, children's seats, agricultural wall art and much more. 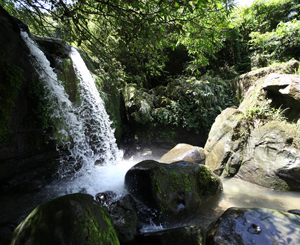 A walk along the trail brings you the full experience of the beautiful Maokong area and its rich cultural heritage. Hours of Operation: Daily 09:00-17:00 closed on Mondays. 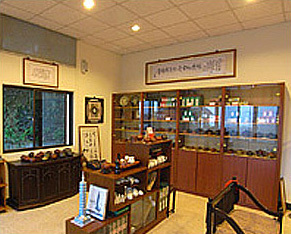 The center's full name is the Taipei Tieguanyin and Paochung Tea Promotion Center. Opened in April 1985, it was originally called the Taipei Muzha Tieguanyin and Paochung Tea Promotion Center and changed its name in 1999. 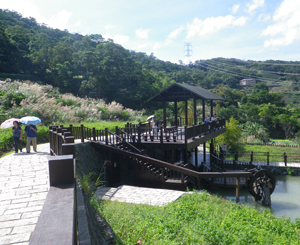 The center includes an exhibition area, an educational area, an outdoor teaching area, an ecological pond, a weather observation platform, an artificial erosion trough and a tea plantation. The exhibition area of the museum explains the production process of Muzha Tieguanyin as well as Nangang Paochung tea, showing how teas are tasted, brewed and preserved as well as the health benefits of drinking tea. There are also displays of different types of tea and diagrams of tea distribution around Taipei. 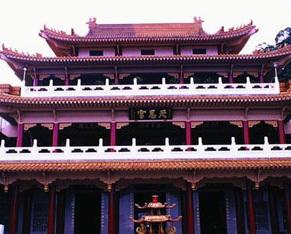 The Tianen Temple is located in the west side of the Tieguanyin and Paochung Tea Promotion Center. It belongs to the I Kuan Tao religious sect in which Maitreya Buddha is venerated. 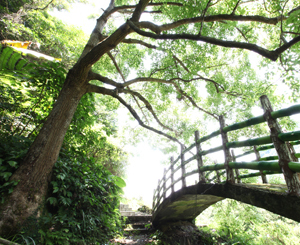 The rural Camphor Trail and the melodic Zhanghu Trail join together to form a circle. 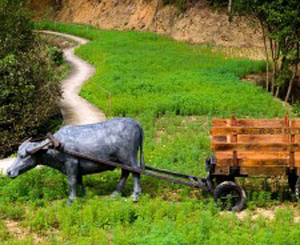 The trails are dotted with various points of interest, such as the Station Square, renovated brick houses, refurbished charcoal kilns, a scenic pond, and public art of an ox cart and a granary, revoking agricultural villages of the olden days. Wandering along the trails, you will find yourself basking in romantic nostalgia. 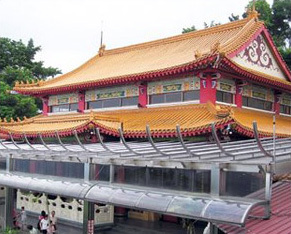 The Zhangshan Temple located in the Wenshan District of Taipei was established in 1931 and has a history of nearly 80 years of devotion to the Guanyin. During the Qianlong Reign of the early Qing Dynasty, hardy pioneers came to Taiwan across the Taiwan Strait and started to develop the Muzha area. As there were more immigrants came to this area in the Jiaqing Reign, they began to develop the mountainous area and settled on both sides of the mountain. In 1930 a group of immigrants from the region near Zhanghu discovered a rock resembled the shape of Guanyin. They took the finding as a sign and began offering up incense in worship. As the number of adherents steadily increased, two of the adherents, Chang Xi and Chang Fa, pledged to Guanyin and subsidized the building of the temple. 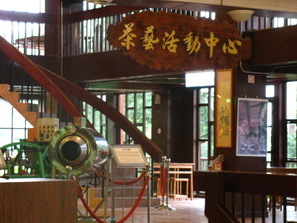 The Chang Naimiao Memorial Tea Museum is currently run by Chang Weiyi, a grandson of the old tea master. The memorial museum honors one of Taiwan's earliest tea masters, Chang Naimiao, who brought in Tieguanyin tea plants from Fujian Province in 1895 and planted them in the Zhanghu area of Muzha, the only place in Taiwan where Tieguanyin is cultivated. Visitors can enjoy the taste of Maokong Tieguanyin in the tea room on the first floor of the museum and admire the many handmade teapots crafted by Chang Weiyi. An admission fee to the second floor is required. Visitors will find displays on the culture and history of Maokong's tea, the story behind Muzha Tieguanyin tea, the history of tea in China, the types of tea, how they are processed, and many more aspects of this marvelous beverage. Although visitors can't produce tea here by themselves, they'll still gain knowledge of tea processing. 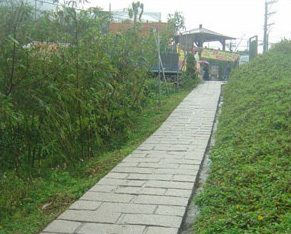 The Sanxuan Temple Path refers to a small stone footpath which passes next to Zhinan Elementary School. If you start out from National Chengchi University and proceed up into the Maokong area, following the river valley to Lane 38, Sec. 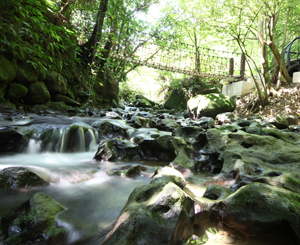 3 of Zhinan Road, you will soon come to a small bridge at Shipokeng where the head of the trail is located. The entrance is clearly marked with a signboard that describes the location and carries a poem: "Shipokeng has bright mountains and clear waters; the farmers listen to a voice singing while they are farming. The farmers in the mountains lead a good life, harvesting bamboo and tea and tangerine. The bright moon above Zhanghu remains unchanged, but the changing world brings renovation." This poetry describes how rural life was since the earliest days in the Muzha area. The bamboo, tea and tangerine plantations can all be seen when you follow this path. 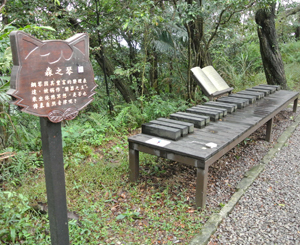 In addition to this signboard which drawn in detail the pathway and the tea gardens in this area, further along the path are aluminum plaques installed to remind the climbers to take a rest and admire the beauty of the tea plantations scenery.